When he was a student, Michael Bricker ’04 was known for displaying his thought-provoking artwork in unexpected spaces. As Visiting Professor of Art this semester, he’s picking up right where he left off. Last Tuesday and Thursday, students in Bricker’s Contemporary Architecture class presented their posters and videos on contemporary regional buildings in the Allen Athletics and Recreation Center. Audio from a student film of the 2009 Skyscraper of the Year in Chicago mingled with the clanking of barbells as students made their presentations across from the fitness center. Exercisers on the treadmills and elliptical trainers had front row seats to the whole thing. The proximity of the structures—which range from the Aqua Tower in Chicago to the Contemporary Art Center in Cincinnati to The Atheneum visitor’s center at New Harmony, Indiana—was central to the class assignment. Students were required to pair up, visit a site of their own choosing, then make a film and present a poster introducing the class to the structure. “I could have taken the whole class to Columbus, Indiana and taken a tour,” Bricker said. “But I’d rather give them a list of 15 buildings I showed in class and say, ‘You and a partner pick which one you want to visit—just impulse—then drive there and explore it. The film/poster presentation is the second of three assignments for the semester. 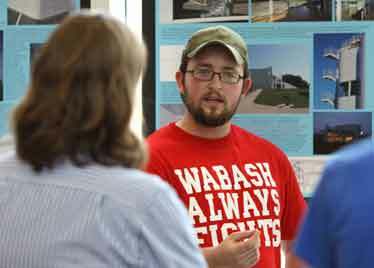 “The final assignment will be installations on campus that challenge the space of Wabash,” Bricker explained. 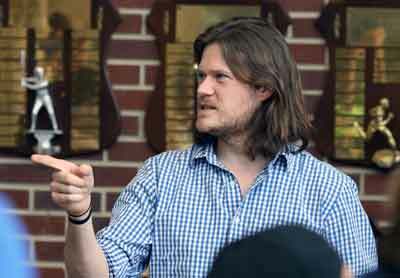 The architect, entrepreneur, and, most recently, production designer for the award-winning film Natural Selection, Bricker said he’s enjoying his time teaching at his alma mater. “I think this is the first architecture class we’ve had, and I love that,” Bricker said. “I’m glad that its contemporary architecture—most of the buildings we’ve looked at have been constructed in the last 20 years. I think that makes it more challenging for the class; not only are they seeing these buildings for the first time, but as a class we’re also trying to define contemporary architecture: What does that mean today when we have so many different types of buildings going up at the same time? How do you know what’s important? Which of these buildings are we going to remember in 50 years? And if you're one of Bricker's students, you're expected to be ready to make those presentations practically anywhere.